Do you have an interest in travel? Do you like to write? You might find travel writing for a blog or magazine of interest to you. As a woman, you can learn more about travel writing at the Women In Travel Summit. The Women in Travel Summit, better known as WITS, is organized by Wanderful, and is the premier event for women travel influencers. Their goal is to provide attendees with the tools, connections, and resources to become better travel bloggers and influencers. They strive to equip great brands with partnerships that can help them enhance their digital presence and meet their business goals. 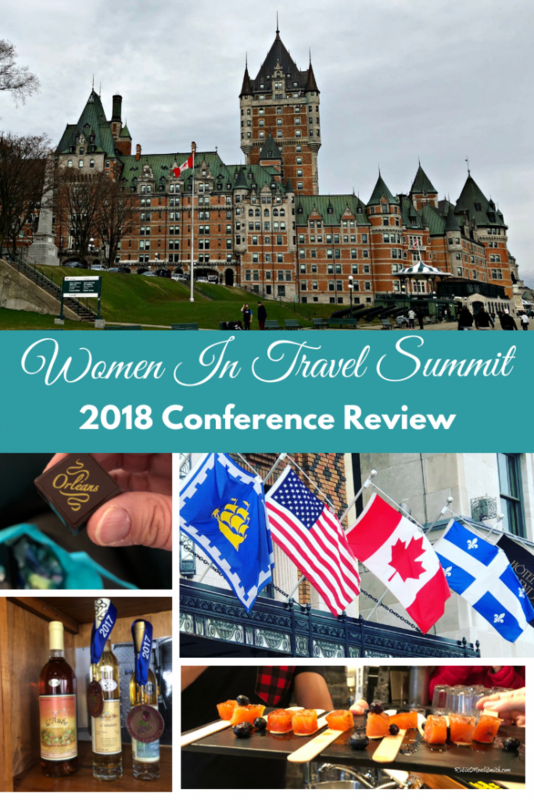 In 2018, their event was held in Quebec City, Canada at the Fairmont Le Chateau Frontenac. It is like an old Castle. When I visited Quebec City the summer before with my family, I declared I would stay at the Frontenac sometime in the future. When I learned the WITS Conference would be there, I was all in. The Frontenac is huge and sits right next to the St. Lawrence River. They have their own boardwalk overlooking the river. 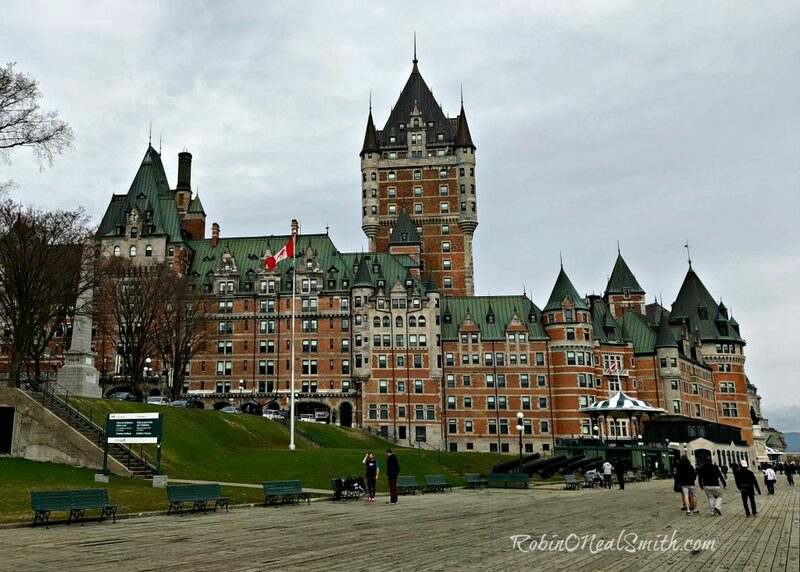 Staying at the Fairmont Frontenac was an experience in itself. One of those bucket list items! The Women in Travel Summit moves from city to city each year. In 2019, WITS will be held in Portland, Maine. The conference itself provides sessions on blogging, finances, working with tourist destinations, traveling solo, family travel, etc. It would be a great conference for any female blogger or travel writer. During the event, over 28 one hour sessions were held. There was something for beginners to advanced levels. They also had several keynote sessions. I personally found the regular sessions much more educational than the keynotes. I felt the keynotes focused too much on personal agendas and politics. In addition, they had a marketplace, mingle events, mentoring events, and more. Parties….they had great parties with fun food and activities. The conference was well organized and I learned a lot. One of the best things about the WITS Conference was the pre and post tours organized by local tourism boards, vendors, and WITS to introduce attendees to the highlights of the area. These opportunities are free and you can attend multiple tours. The tours started two days prior to the conference and ran two days after the conference. Some were half day and some full days. All attendees were eligible to attend. Tour of local eateries in Quebec City. 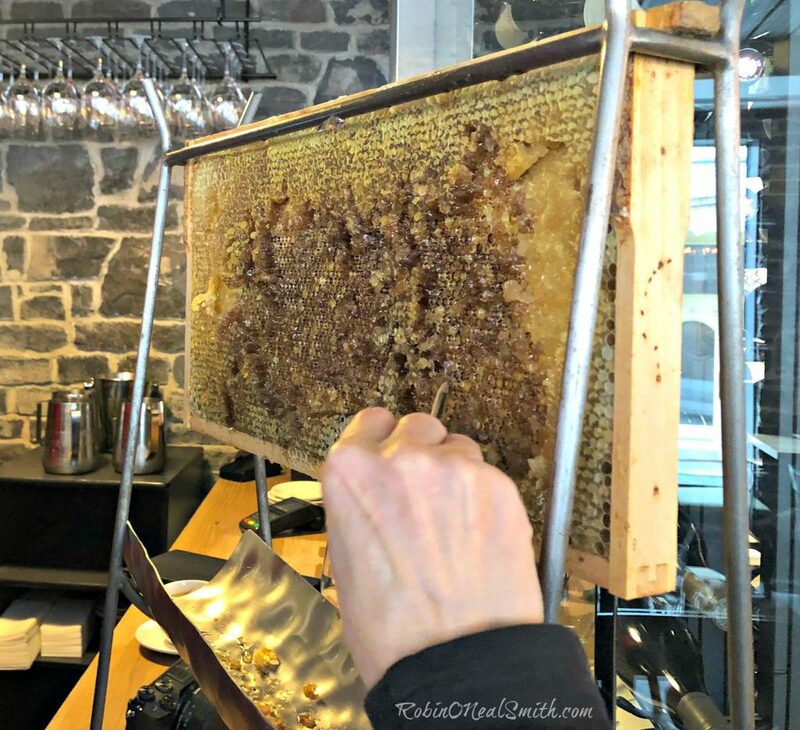 We visited several restaurants for appetizers, a maple syrup tasting, drinks, a “farm to table” establishment where we sampled some honey, a chocolate shop, and several other places. This was a walking tour and the only bad thing about it was the weather. It was cold and rainy. But we endured and enjoyed the tour. Our guide was very knowledgeable and provided lots of information. On this tour, we were transported by the Quebec Bus Tour Company to Ile d’ Orleans, which is an island in the St. Lawrence River about 15 minutes from downtown Quebec City. The island was one of the first parts of the province to be colonized by the French. Quebec Bus Tour Company provided transportation to Ile d’ Orleans for the Farm and Market tour. 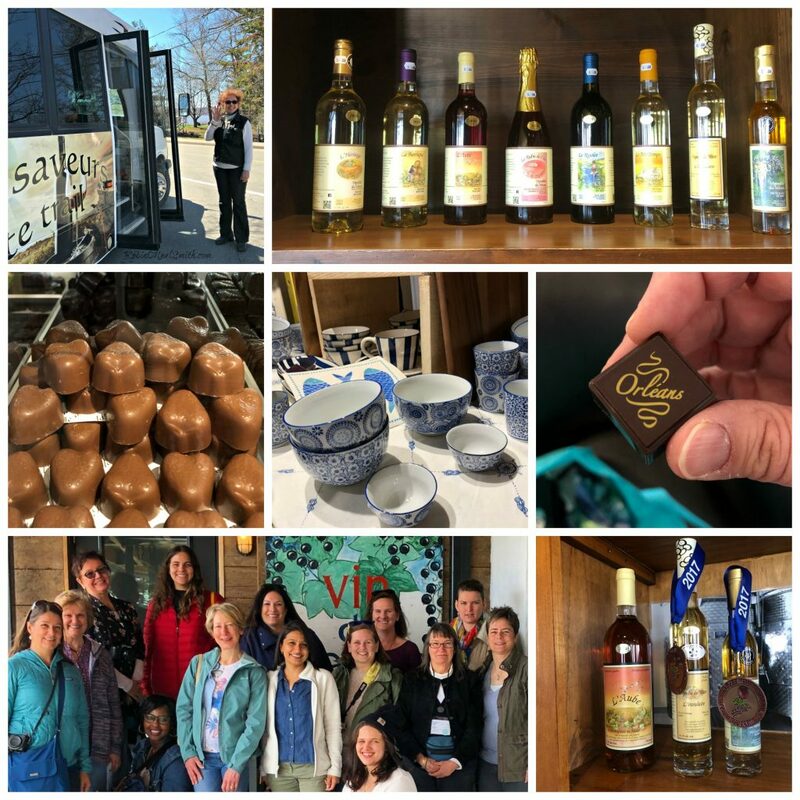 The tour took us to several boutiques, a candy shop, wine tasting, a café, an iced apple cider store, a blackberry wine store and more. They also have pre and post multiple day familiarization trips (FAM). You had to apply in advance for the FAM trips and they accepted a limited number of people for each of these trips. The FAM trips were also free but you had to provide transportation from endpoints to home. I did not participate in these. WITS had a mix of beginner level sessions as well as more advanced ones. The Tours were the highlight of the event. Keynote sessions were ok but focused on too many political issues for me. I just wanted to learn about travel. Lunches were included, dinners were on your own. But if you attend the parties, you can make a meal out of them. Networking with industry and brands was possible. There was a marketplace with brands such as tour companies, travel products, and a few tourism boards. There were opportunities to partner with some of the brands and start a conversation about visiting some of the destinations. These were set up by appointment — so we could request appointments or the exhibitors could request an appointment with us. Just being honest — it was hard for new bloggers to get appointments in the speed networking due to the volume of requests. But, you could also ditch a session and go to the marketplace to chat with the vendors. The venue was a great place for travel writers. I personally had an incredible time meeting the variety of bloggers and speakers, attendees and volunteers. I plan to attend the 2019 event in Portland, Maine at the Holiday Inn Portland–By The Bay. They have two price options. Regular registration and Registration with a Blogger 101 day. Blogger 101 is for beginners. I had a regular registration which included the various tours. Had I arrived earlier I could have attended more tours. They do have early bird pricing that will save you a few dollars. Casual dress is fine. Be comfortable. If at all possible, stay in the Conference Hotel. You miss a lot when you stay elsewhere. Plan to arrive a day or two early and stay a day or two late if possible so you can attend the free tours. Sign up for tours when they come out. They do fill quickly. Read the fine print about the tours so you know how to dress and whether you will be riding, walking, etc. Decide in advance what you hope to get out of the event and make sure you schedule accordingly. Plan to network with other attendees. Explore the hotel and the area. Take good notes and lots of pictures. Plan to have a great experience. Let me know if you are planning to attend so we can meet up and discuss travel writing.